ATTENTION RESIDENTS!! On Saturday, May 11th from 8AM to 12PM members of the Environmental Advisory Committee will once again be selling Rain Barrels for $15.00. Water Testing Kits will also be avaiable for pick up on Saturday morning. A member of the EAC will provide you with the information and instructions at that time. The Township of Bushkill is pleased to announce our participation in the Nazareth Area Council of Governments Animal Control Program. Beginning January 1, 2019, Pibbles Paws Safe Haven will serve as our Animal Control Officer. The animal control program will only cover dogs at this time. Pibbles Paws Safe Haven is located in Moore Township and is a state-licensed facility that currently works to rescue adult dogs and puppies in need of a forever family. The Facebook page for the animal control officer is Pibbles Paws Safe Haven ACO Stray Intakes. Pictures of lost or stray dogs will be posted on this page as well as other important information. If you see a lost or stray dog, please contact Northampton County Non-Emergency at 610-759-2200. Do not call 911. Your local police department will determine if the animal control officer will need to respond. The Bushkill Township Board of Supervisors will receive public comments on the proposed Pollutant Reduction Plan required for the 2018-2023 NPDES Municipal Separate Storm Sewer Systems Permit. The proposed PRP is available for review either online or at the Township Office located at 1114 Bushkill Center Road, Nazareth, PA 18064, from 8:00am to 4:00pm., Monday through Friday, July 18 through August 17, 2018. The Township will accept written comments for 30 calendar days from the date of this notice, must be postmarked no later than August 17, 2018, and addressed to Brian Harris, Township Manager, at the address listed above. Email comments may also be submitted to harr3271@bushkilltownship.com. The email subject line shall include "Comments - Bushkill Township PRP." The Township Board of Supervisors will provide an opportunity for interested parties to provide comments during their regular scheduled meeting on August 2, 2018, at 6:00pm at the Municipal Building. You can view our Pollutant Reduction Plan HERE. Snow plowing on all township roads begins after 2 inches of snow has fallen. If an accumulation of snow is in the forecast, be on the safe side and remove your cars from the street. Anytime snow plows are dispatched during a snowstorm, parking is prohibited on all township roads except in areas where no off-street parking is available. In those areas without off-street parking, all motor vehicles shall be parked on the even address side of the street on even numbered calendar days, and on the odd address side on odd numbered calendar days. Please do not park in cul-de-sacs during snowstorms. Any vehicles parked on the street during a snowstorm may be towed and fined. The Township�s snow removal procedure calls for snow emergency routes to be salted first. This is to ensure that all developments can be accessed by emergency vehicles (fire, police and ambulance). During heavier snowstorms, snow emergency roads will be completely cleared prior to equipment starting to plow secondary roads. Should you have a non-medical emergency during a snowstorm, please contact the Bushkill Township Police Department at 610.759.2200. For medical emergencies, please dial 911. Bushkill Township is located in northcentral Northampton County. 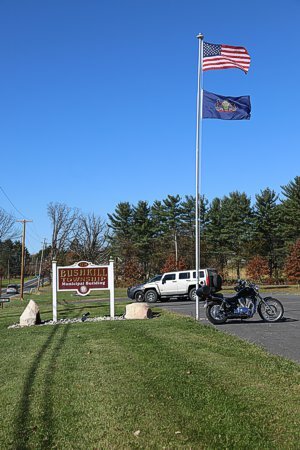 Until formation on August 13, 1813, the land area of Bushkill Township was part of its parent municipality, Plainfield Township. Before that time, the area of Bushkill Township was often referred to as "The Plains." On the north the Township is bordered by the Blue Mountain and Monroe County, with the Appalachian Trail running all along the summit of Blue Mountain. Plainfield Township and the Borough of Wind Gap border in the northeast, with Plainfield Township extending along the east to the Borough of Stockertown at the southeastern corner. The lengthy western border is with Moore Township, and the shorter southern border is with Upper Nazareth Township, just north of the Borough of Nazareth. The Township is approximately 25 square miles and has over 55 miles of municipal roadways.